Chocolate covered cherries are one of my favorite sweet treats. Long ago, before I went vegan, they were the first thing I’d pull out of a Whitman’s Sampler. Those cloyingly sweet chocolate cherries aren’t in my life anymore, but this chocolate covered cherry smoothie bowl really hits the spot when I’m craving that sweet treat. So, this is basically my favorite dessert, translated into breakfast form, and what a breakfast! It’s rich with fruity and chocolatey goodness, but it’s also got some sneaky kale, so you can feel good about eating dessert first thing in the morning. You’re welcome. Guys, I’m super excited to announce that I produced my very first recipe video! I’m new to this video thing, so I decided to start simply with a smoothie bowl recipe. You can watch the video here and scroll down to the recipe below, if you prefer having things written out. 1 cup vegan milk of your choice - You can add up to an extra 1/2 cup, depending on how thick or thin you want your smoothie bowl. 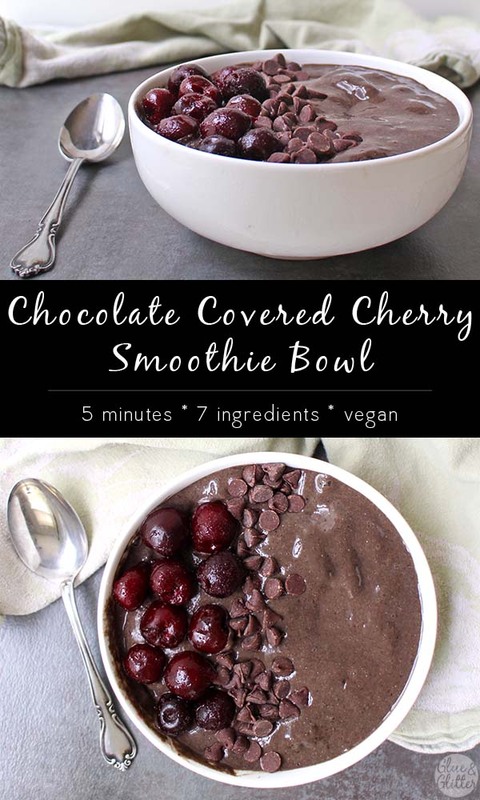 Combine all of the ingredients (start with 1 cup of milk) in your blender, except for the chocolate chips and extra cherries. Blend until smooth, adding the extra milk a tablespoon or two at a time, until you get a nice, thick, smooth mixture. How much extra milk depends a lot on your blender. 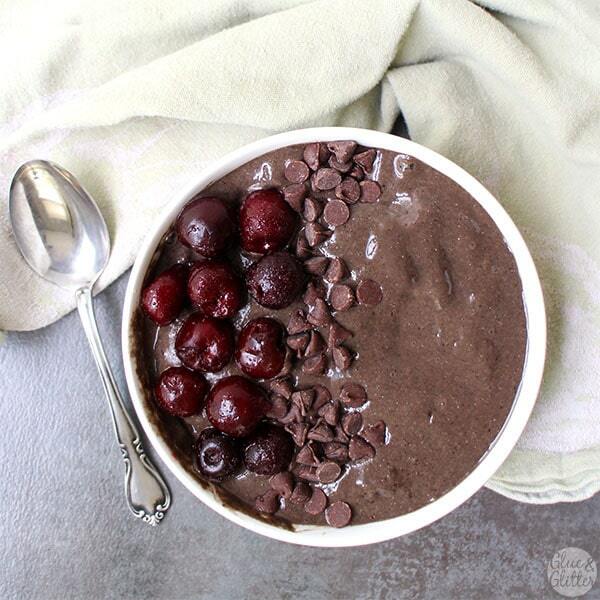 Top with the chocolate chips and extra cherries, and serve. I used to love chocolate covered cherries too! Love how you have made this treat into something so wholesome. Great video too – well done! Scheduled to pin. Thank you for sharing with us at the Hearth and Soul Hop. Smoothie bowls are just amazing! And anything with chocolate is just DROOL! 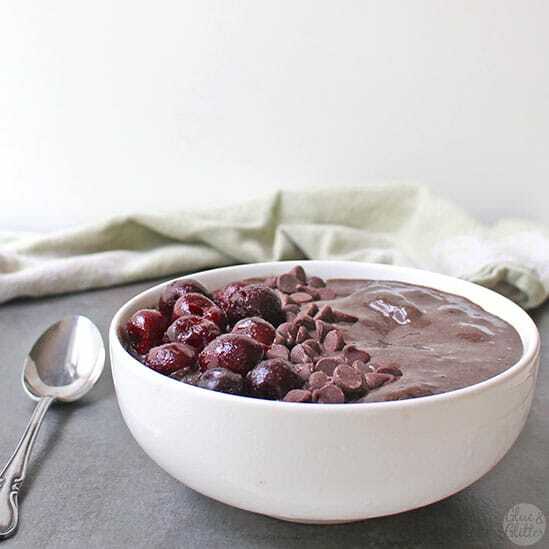 chocolate covered cherry smoothie bowl looks delicious perfect for kids, thanks for sharing with Hearth and soul blog hop, pinning and tweeting. This is definitely my kind of smoothie! I don’t think I can make a smoothie without adding some greens, and cherries are my all-time favorite smoothie ingredient. Love the video and can’t wait to see more of them! Thank you so much, Cadry! I’m excited to make more of them! Chocolate and cherries are my favorite foods ever. Together, they’re magical! Hurrah! When I’m thinking about flavor combinations, I definitely strive for magical. Thank you, Dianne! You made a video!!!!!!!!!! 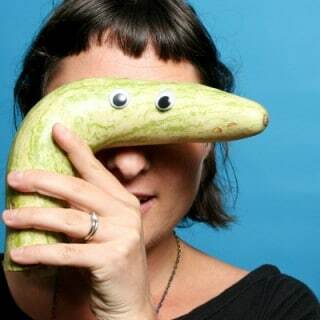 I’m so excited, and such a delicious way to jump into the youtube world too. Chocolate videos are the best kind 🙂 I hope you make more!